Wood density profiles revealed significant differences in wood formation along a precipitation gradient in the Congo Basin. 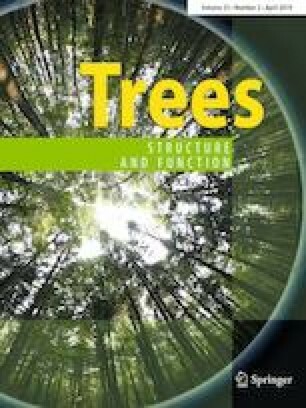 The response of trees to climate change varies depending on leaf phenology properties. Tropical forests face increasing pressures due to climate change and yet, the response of trees to varying climate conditions remains poorly understood. In the present study, we aim to fill some gaps by comparing the leaf phenology and the pith-to-bark wood anatomical variability of 13 common tree species of the Democratic Republic of Congo among three sites presenting contrasted rainfall regimes. We measured pith-to-bark density profiles on which we applied wavelet analyses to extract three descriptors, which we further used as proxies to describe and compare wood anatomical variability. They describe the growth periodicity, regularity and the amplitude of variations of the anatomical patterns. Our results show that evergreen species tend to have significantly higher anatomical variability where rainfall seasonality is more pronounced. Deciduous species, in spite of shedding leaves for longer periods in drier sites, did not show significant differences in their anatomical variability. The analyses of density profiles and phenology records suggest that the seasonality of precipitation influences both leaf phenology and cambial activity. The high intra-site variability in phenology and anatomy suggests that site-related micro-climate conditions also influence cambial activity. The online version of this article ( https://doi.org/10.1007/s00468-019-01826-5) contains supplementary material, which is available to authorized users. We are grateful to the FNRS-FRIA (FC 1371) and the Jaumotte-Demoulin foundation (Van Buuren funds) for supporting and funding, to the WWF DRC (Bruno Perodeau, Jean Mobuli), NGO MbouMonTour (Jean-Christophe Bokika), UniKis (Hippolyte Nshimba, Sylvain Kumba) and ERAIFT (Baudouin Michel, Bhely Angoboy) for logistical support, to Jean-Claude Cerre, Stijn Willen (UGent, Belgium), Thomas El Berkani and Manoe De Neck for assistance with sample preparation and scanning, to Maaike De Ridder (RMCA, Belgium) for advice, to the local community chiefs from villages Nkala, Mpelu, Yoko and Luki for authorizations, and particularly, to Pala, Mora, Alpha, Ridjo, Mbambi and Placide for fieldwork assistance. Dr. Koen Hufkens acknowledges support from the NSF Macrosystems Biology programme (award EF-1065029). Finally, we thank Pr. Adeline Fayolle from ULg for her help during the redaction of the manuscript. YT, KH, JVB, JFB, HB and CC planned and designed the research. YT, JDB and KH collected data. YT, SH and OD performed experiments. YT, KH, JB, JFB and CC analysed and interpreted data. YT and KH wrote the manuscript. All the co-authors revised the manuscript.